5K @FactOrFaked Twitter Contest! The contest rules are simple. I'm following @FactOrFaked to #netamermaid. 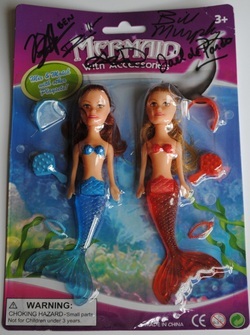 When you tweet the message you will be eligible to win a mermaid signed by Ben Hansen, Bill Murphy, Jael de Pardo, Austin Porter and Devin Marble. Must follow @FactOrFaked to win. *Contest open to US Residents only. Exception to the Outside of the US Rule: You can pay the difference in shipping cost for me to send. You are entered in the contest when you tweet the message and follow @FactOrFaked. The @FactOrFaked twitter must hit 5,000 followers. The Contest ends on Friday, June 10, 2011 at 11:59 pm eastern or after if the twitter hasn't met 5,000 followers by then.